“Stand By Me” meets “Evil Dead 2” in the 1980’s throwback feature “The House On Forest Drive” a raw blend that mixes coming of age nostalgia with over the top violence and gore, a real B-rate Bloodbath of enjoyment, with plenty demon bashing BMX action, what’s not to love. The 80s is back in a big way, thanks to Stranger Things. I’d like to welcome our campy overlords of horror back to their proper place, but in order to do that…well, some awesome new creators are going to need help to get there. This one in particular sounds like just the sort of thing to get started with. Let’s make horror films fun again, the protagonists likable, and the gore entertaining. That’s exactly what I thought of when I discovered this kickstarter project, and that’s what I hope you, the readers think, as well. Sound like the sort of project you’d like to get behind? Then please check it out and do what you can to see it become a delightfully destructive reality. 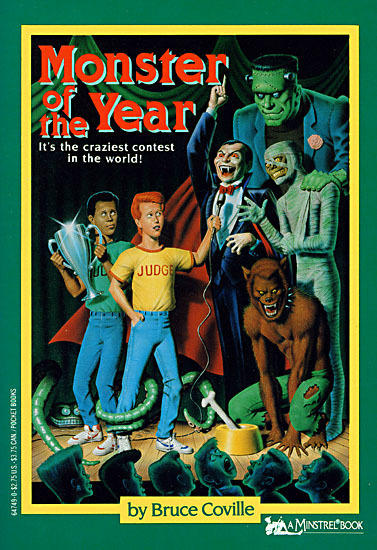 As a kid, when I wanted a spooky book at the school library, I’ll admit I judged everything by the cover. In early elementary school, I adored the card catalogue (I’m sure some of you remember those huge filing cabinets with ‘key words’ scrawled in .2 size font.) I knew that without fail, Bruce Coville always had books with the best covers. I still remember the day I found this book based on the key word ‘monster’. It was cute, it was fun, and it was perfect for a kid like myself…who enjoyed nothing more than putting as many monsters together in one story as possible. It’s basically about a boy who gets a gift from his dad: a billboard. He can do anything he wants with that little bit of ad space…so he decides to make something fun. A piece of art for a ‘monster contest’. What he doesn’t expect, however, is monsters from around the world showing up to take part. Who knew roadside ads were so effective? Digging in the digital closet for a few tunes to liven up an otherwise dead party? Well, don’t worry. The 2014 playlist is finally ready, with 13 tracks old and new. Spooky and fun enough to get the bones rattling. In this episode of the podcast, we read a dramatization of an audio play I wrote a couple of years ago for a play writing class. A story about a woman battling couch cancer. Literally a giant blob of cancer living on her couch. We also chat a bit on the topic of old time horror radio, and even touch on the new Hannibal tv series. Now that we’re really getting the ball rolling, I’ve got this year’s October Netflix list for every day of the month. What does that mean? It means I invite you guys to join me in watching each and every one of the movies on this list every day of the month. You get a freebie for yesterday, but if you really want to make up for it…it was I Sell the Dead. This year I’m diving into dangerous territory, I have not seen many of these. But it will be an interesting experience for all of us. Plus, plenty of fodder for our weekly podcast. A quick note on Dumplings, if you have a weak stomach…probably best to skip this one.